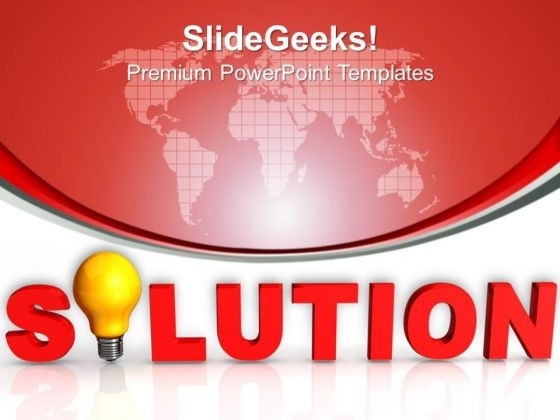 Business Solution PowerPoint Templates And PowerPoint Themes 1012-The above template displays a diagram of word solution and light bulb replacing word 'O'. This image represents the concept of creative thinking and brainstorming. Brilliant ideas are your forte. Our business solution template will help pinpoint their viability. Our stunning image makes your presentations professional showing that you care about even the smallest details.-Business Solution PowerPoint Templates And PowerPoint Themes 1012-This PowerPoint template can be used for presentations relating to-"Solutions technology, light bulbs, advertising, marketing, business, success" Our Business Solution PowerPoint Templates And PowerPoint Themes 1012 define the standards. Like you they excel at what they do. Advocate your case with our Business Solution PowerPoint Templates And PowerPoint Themes 1012. They will deliver a strong defense.